Eric collected my car, fixed it and delievered it back to my door for an unbelievable price. Will definitely be using Bedford Motors from now on. Great service. Brendan Walsh. Spray painting and damaged bodywork. From wheel alignment to engine rebuilds. At Bedford's Auto Body Repairs, we will offer up to €100 off your Insurance Excess payment (depending on the value of the repair invoice). Over the years we have given up to €250 off a customers excess (terms and conditions apply). With 5 decades of experience under our belts, no-one understands your vehicle better than we do. We are only a phone call away. If your vehicle or company vehicles require accident repairs, car crash repairs or a pre nct service, we will be more than happy to help. Our Goal: Our primary concern is to get your vehicle back to you in perfect condition, as quickly as possible, and with the minimum amount of stress. All the while ensuring a very high standard of workmanship and care. We are linked to all major insurance companies and can offer a free estimate by our expert mechanics and panel beaters while you wait. We are fully aware of the inconvenience of losing your vehicle whilst in for repair. This is why we have courtesy vehicles on request. Established in 1960, Bedford's Auto Body Repairs has grown to be one of Ireland's premier crash car repairs and Mechanical service centres. During that time we have built an excellent reputation for both quality and service. We have an easily accessible south Dublin location which is five minutes from the new Dundrum Shopping Centre and the M50 motorway. As members of the Society of Irish Motor Industry SIMI we carry out work on behalf of all major insurance companies and invoice them directly so you don't have to pay. By utilising state of the art equipment our work is always completed to the highest standards of professionalism. All repairs are completed using Standox paint, with the latest waterborne paint technology. Standox is one of Europe's leading manufacturers of automotive refinishing paints. Advanced technology Standox materials set the standard for speed, versatility, appearance and colour accuracy. List of some of the car manufacturers using Standox: Audi | Bentley | Seat | Skoda | Volkswagen | Alfa Romeo | BMW | Mercedes Benz | Smart | Mitsubishi | Volvo | Isuzu | Renault | Mazda | Mini | Citroen | Peugeot | Ford | Hyundai | Honda | Kia | Nissan | Fiat | Suzuki. Click on image above to see our location on Google maps. Having car problems? Need to get your vehicle back on the road? 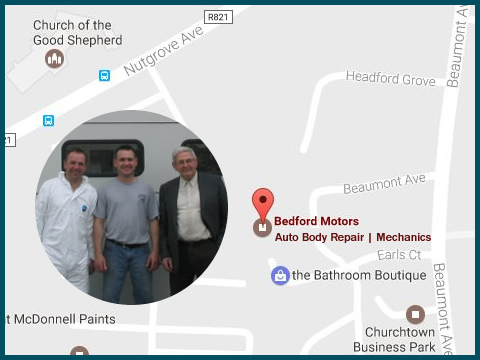 If you would like to know more about Bedfords Auto Body Repairs or the services we provide, then don't hesitate to call. You can reach us by either phone numbers, or by filling out the enquiry form and a member of our friendly team will get back to you as soon as possible.